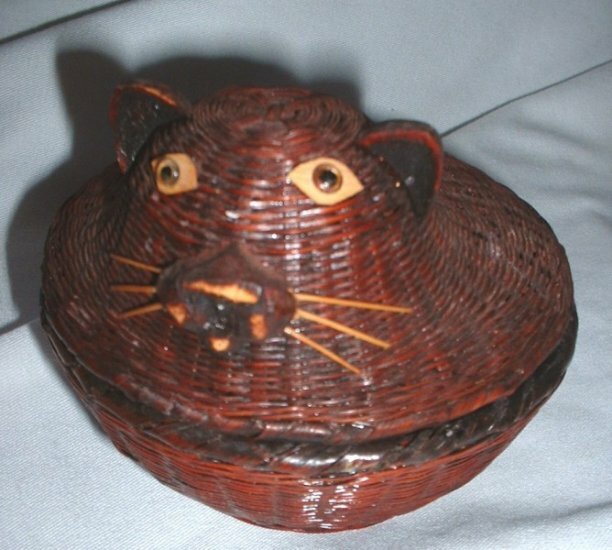 An on-line store featuring many different items, some used, some new, some collectible. Weird, fashionable, usable or just pretty or pretty ugly. But never dull! I'll add a little history or background or just a little whimsy to the items I display here. I'll also write about, on occasion, the meanderings of my life, why? I don't know, I guess because I can and blogging is kind of like a journal. No doubt everyone knows the huge floods we've had here in Colorado last week. I thought the rain would never end. My area of town was not much affected but whole towns were completely devastated and roads washed away. I have been on the university's alert system for sometime now and my phone kept buzzing with alerts all through Wed; Thurs., Fri. constantly, I was terrified! I heard the chinooks and black hawk helicopters for hours on end during the daylight hours once it stopped raining flying into the mountains to rescue and help evacuate people. The national guard used our municipal airport (1 mile from me) as a home base and as I was making my way home last Thursday from work there were 2 national guard humungous vehicles driving through flooding waters at the street I usually turn on to go home and was quickly diverted to take another route. The street flooding there was probably up over my tire wheels. Love and prayers to all those affected, displaced and unfortunately lost, my heart goes out to everyone. And a HUGE THANKS to the National Guard, they have been our heroes and angels in this most devastating time in all my years in Colorado. We love you! I'm wrapping up the Online Sellers scavenger hunters theme for last week (always behind I know...) which was grass. My last post I could only think of grass, as green grass, in parks on lawns and walking on it. I hadn't even thought to explore the larger picture of different grass types and purposes of said grasses. Did you know there's 37 types of ornamental grasses alone? And dried grasses are soft and pliable and are easily woven into soft baskets, hats and handbags? And one of the most commonly used grasses to make wicker is sea grass, which is especially durable. I had no idea so I went on a scavenger hunt to see if any of my fellow Online Seller scavenger hunters had any of these sorts of items. And look what I found at KatzzsKloset. Not one, but two delightful wicker baskets. So stop on by Online Sellers and visit all of us to see what treasures you can find! I feel like I've been in some time warp or something and haven't been doing anything with the scavenger hunters on Online Sellers. I also haven't been minding my own store. In fact I have almost given up the whole selling/blogging/social networking scene. Burnout maybe. I have, however, been busy cleaning out my garage a few mornings a week and had 3 huge pickups from some local charities. Now you might wonder why I don't list the items on my store, well, the stuff was mostly clothing and I don't really want to deal in clothing. I still have a ton of electronics, but no time to test them to see if they work, so they'll be going as well. Sure, it would have been great to see if I could make a little money off all this stuff, but I just wanted it gone. I may still have a garage sale to see if I can get rid of the tons of books, CD's, DVD's I still have. I figure as long as I can get my car back in the garage by winter it's no rush right now. The Online Sellers scavenger hunter theme this week is grass. So far the grass here has been staying pretty green with watering help as we've not had much rain. And it's very lovely to walk in your barefeet. The days are hot and summer is in full swing. Le Petit Marche doesn't have any grass or anything to complement grass, but nothing enhances a nice lush green yard than flowers so in that vein I found this lovely gardening book Designing Beds and Borders at Eccentric Thrifter. Many of the scavenger hunters have gardening books and perhaps picnic items that would be nice for a picnic on a lovely green grassy lawn. Some come visit us! The last 2 Mondays we've had snowstorms, depressing for sure. But today it is 70F and I'm happy as a clam out of her shell. Went for an hour long hike yesterday and another lovely walk around the lakes today. The Great Blue Heron is ever present now and I just love watching him stalk his fish in the lake. I love listening to the bullfrogs doing their "froggy" things and the ducks doing their "ducky" things at the lakes when I go to bed. Finally, spring has arrived! And what says spring better than the colors violet and minty green? And new puppies! These were/are some of the themes of the scavenger hunters on Online Sellers recently that I've missed due to this and that. I found this lovely pair of violet Tinkerbell PJ's at Nancy's Doll Closet. Very cute! 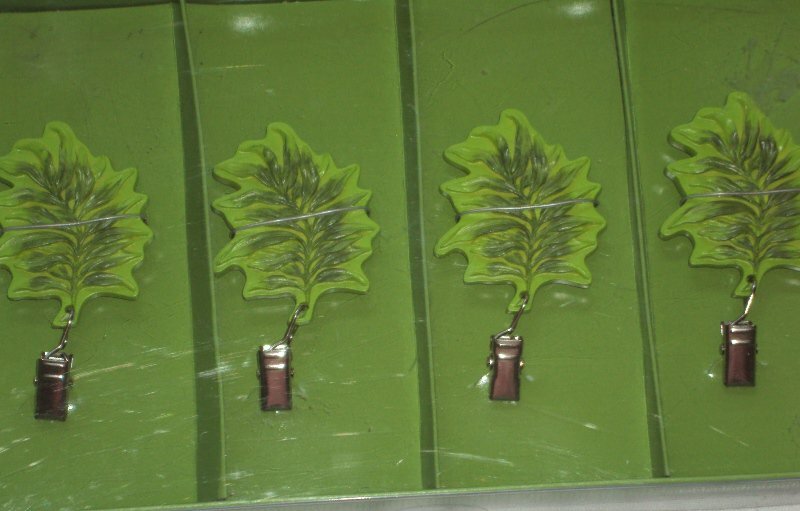 And then for minty green I found this lovely set of 4 Green Leaves Picnic Table Weights at Katzz Kloset. And for puppy, I found this lovely Hallmark Pet Gift Set Photo Frame and Heart Tag at Eccentric Thrifter. Stop on over at Online Sellers and see what you can find to give your spring a jolt, there's lots of fun items in every scavenger hunters store! I like to believe I'm a budding entrepreneur, even if it is a little later in life. I can't quit the day job, but shopping and selling is really a lot of fun. I consider it a hobby at the moment. And it's the most rewarding hobby ever! And I just keep branching out, it's great!